What are the steps to install rubber pavers on a dirt surface? 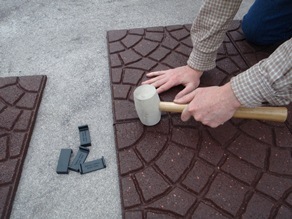 Here are some simple steps for installing rubber pavers such as "Envirotiles". Since spring is fast approaching, you may want to consider using them for your next outdoor project. If you haven’t heard the good news yet, envirotile is one of the most innovative and best products to use in areas where you want to upgrade the look of any area in and outside your home. The key to its durability is in its construction. 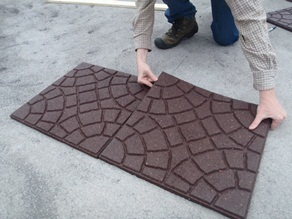 Envirotiles are made from 100% recycled rubber tires! In fact, the manufacturer of envirotiles, Multy Home, diverts over 2.5 million tons of tires from landfills to produce their line of green products. Best of all, each 2 envirotiles purchased means 1 tire from being in a landfill! We’ve already got some great information going over specific envirotile installation questions and concerns on the community, answered by envirotile experts Designingwoman and ChrisFixit . The thread contains more detailed information such as project estimators and specific installation questions, like adhering the tiles down. Please refer to it for any further information. In terms of usage, the possibilities are almost endless for putting down a durable and efficient material underfoot. Envirotiles can be installed on top of existing outdoor surfaces, on level dirt, and can even be put down in basement areas inside your home! The other important takeaway that I would like to share with you in this post is that envirotiles are available in stair treads, stepping stones, and edging for the regular tiles. 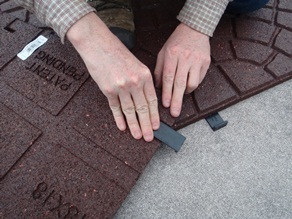 Our how-to guide for this post and video will go over standard 18” x 18” envirotiles. Putting them down will depend on if the surface is level (within 1 inch) over either a hard surface or soil/natural surface. In this how-to guide, I’ll first go over laying them out over an existing concrete surface, followed by installation instructions over soil. 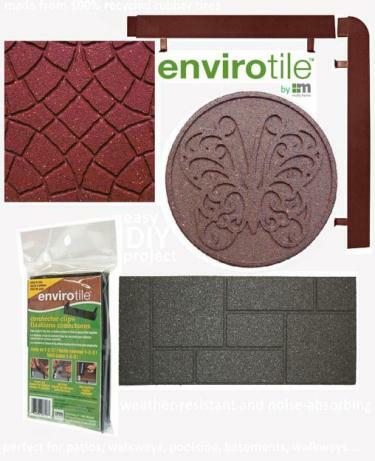 Let’s get started first with a basic supplies list you’ll need to install envirotiles over any surface. As the video shows, we decided to put down our envirotiles on concrete adjacent to the flower beds since it is an area of high activity and a focal point. While you may have other reasons to plan out where and how you want your envirotiles to be set, I find that planning it out beforehand works in case you run into any unforeseen problems down the road. For example, you’ll need to ensure the ground is first level, clean, and free of debris. 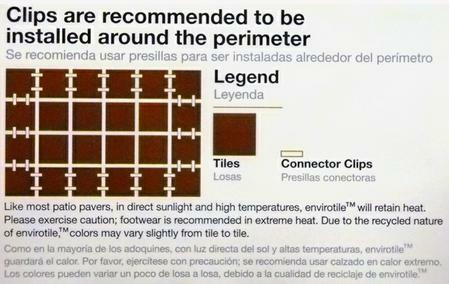 Also, take into consideration any curves, intrusions, or areas of the tiles that may need to be cut. Since we are going with a simple square pattern, I decided to mark as a starting point where the tiles would be first installed. Shown below in more detail, these illustrations should serve to show you how to put together and keep down envirotiles on a flat surface. The clips are a very simple installation. Simply line up your tiles as shown below with the clips facing up. Next, to ensure a tight fit, be sure to hit the connections above with a mallet. Putting envirotile over soil takes a little more steps than over existing hard ground surfaces, but installation can be easily done. Follow the same layout directions as you would install outdoor concrete pavers, but you are laying out the tiles exactly as stated before. To ensure they won’t shift, you will need to fasten the perimeter tiles with envirotile clips but you won’t need any adhesive. Anytime you are placing tiles on soil, consider proper drainage and presence of water where the tiles will be installed. Using weed blocker or landscape fabric can be placed before the tile goes down, but make sure the surface is level as possible. If you run into soft soil or just want the soil to be thoroughly compacted, I’d recommend renting a gas-powered tamper from your local Home Depot Tool Rental. Whether you install envirotiles over an existing hard surface or soil, you’ll need to make sure you’ll have enough for the job. Just like any tile project, buy an extra 10% (or 20% if you are doing curves or diagonal shapes) to ensure you’ll have enough for the project. Since it is a recycled material, some edges may not line up perfectly, which is why having a few extra tiles will help you when it comes to final installation. And as always, you can return any unused tiles to your local Home Depot after you are done with putting everything in; but keeping a few tiles for replacement is always a good idea. Plan out before installation when using checkerboard or other stylized pattern designs. When you are done installing your envirotiles, consider using a border to reduce trip hazards give a finished edge to any perimeters exposed. These borders can be found in-stock or online, and are just as easy to install as the tiles. They already come with built-in clips to ensure a secure fastening to the tiles, and are available as straight edges or corner edges. 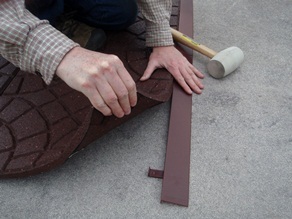 Simply lift the edges of the tiles after they are put in, and secure them in place with a mallet via the built-in clips. You may have other areas of your garden, backyard, or lawn that you’d like to maybe not put down tiles, but still would like to put a small pathway. With envirotile, they have you covered there as well! We also sell numerous stair treads and stepping stones to compliment your space. So there you have it, how to install envirotiles, the most eco-friendly and easiest way to put down a surface for your outdoor areas! Hello lakersfan525 and welcome to the Community. 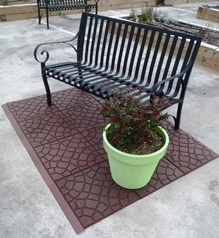 Although Envirotile is a great product, they need to be installed over a hard surface. They are not intended to be put down directly on a dirt or loose surface. When installing any type of pavers you must start with a stable surface. Here is a link to Pavestone pavers. Click on the small boxes, with an arrow in them, to the left of the products photo, to see installation videos. This is what that video link looks like. 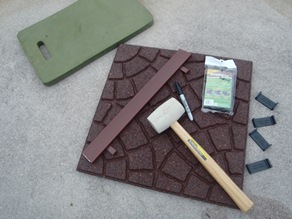 Here is a link to how to build one type of a Paver Path. Click here to see another type of paver path. If you have a particular rubber paver product in mind please let me know what they are and I can address the particular installation process for you.